Mining is one of the most played skills on RuneScape because it’s a great and easy way to earn OSRS gold. It’s relatively afkable and as the name suggests, what you do is mine ores and gems from rocks, then use them to make bars or equipment with Smithing or just sell them for a good profit. Starting your Mining OSRS training is simple: you just need to buy a pickaxe and find yourself a mine. All new players are given a bronze pickaxe when they’re completing the Tutorial Island so if you keep it, you don’t even need to spend OSRS gold on it. To locate a mine, you need to look around for a grey pickaxe icon on the minimap. If it’s gold, that’s a mining shop, not a mine. Once you’re in the mine, you just have to left click on a mineable rock and wait until they obtain an ore or a gemstone. If you’re new to this, you’re probably going to need some time remembering which rocks are mineable. You can find out by right clicking on them and choosing the “Prospect Rocks” option. An interesting thing about OSRS Mining Guide is that it’s mostly based on your luck, which is not something you see often in OSRS. All players eventually mine the rock they’ve picked, but it’s totally random whether it will take eight or twenty hits to obtain the ore. The ore you get in ten hits…another player may get it in one. So if you’re a lucky person in general, you must definitely try this skill! However, it’s important to note a pickaxe of a higher metal allows you to mine faster regardless of your luck. Once you mine the rock, it will turn grey for a little while, and then respawn and regain its color. This makes it available for mining OSRS again. The higher the level of the rock, the longer it takes to respawn. Iron rocks take like 3 seconds, while runite rocks need 12 whole minutes! Pickaxes can’t be made with Smithing. You can buy OSRS gold and go purchase your pickaxe of choice from Nurmof in the Dwarven Mine or Tati in Keldagrim. The higher your Mining level, the better pickaxe you will be able to afford. The best ones are the Dragon pickaxe and the 3rd age pickaxe, both available after 61 lvl. By using a Smouldering stone on a Dragon pickaxe, you can create Infernal pickaxe, but only if you have 85 Smithing. If you’re power leveling and want to get the fastest xp, the infernal pickaxe is a must. It smelts 1/3 of the mined ores which greatly reduces the amount of rocks you need to drop and provides Smithing xp. It’s kind of expensive though, so you will need to buy OSRS gold. Most players start with Iron pickaxe, move to Steel on level 6, then on 11 use Black pickaxe, Mithril on 21, Adamant on 31, and Rune pickaxe on 41. Make sure you’re always using the best pickaxe available at your level. It’s best to wield your pickaxe rather than just have it in your inventory because this way you can free up more space for ores. However, you can only wield a pickaxe if you have the required Attack level for it. I mean, the pickaxe is a weapon after all… The highest Attack requirement for a pickaxe – The 3rd age pickaxe, is 65. You’ll have no time using it in your inventory if you don’t meet the Attack requirement though, you just won’ be able to wield it. It’s good to have Varrock armour, because it grants you 10% chance to mine 2 ores at once when it’s equipped. To get it, you need to complete task sets from the Achievement Diary OSRS, the Varrock one in particular. Depending on which difficulty level you’re tackling, you will get Varrock armour which boosts with this bonus up to coal, mithril, adamantite or runite. If you’re playing pay-to-play OSRS, you can get the prospector kit from Prospector Percy in the Motherlode Mine. This provides a total of 2.5% bonux xp for every mined rock. It won’t be useful if you’re trying to get to max level and be quick about it, but it’s a requirement for a master clue step so you might want to get it anyway. It’s recommended to wear as few items as possible because you can run longer without losing a lot of energy in a short time. Boots of lightness are a good choice since they make your weight lower. You can obtain them in the Temple of Ikov. The Graceful outfit is a great pick too. If you have 40 Defence, you might wanna play the Barbarian Assault minigame to get the Penance gloves and wear them. If you are in the Wilderness, player killers may try to kill you to get some ores. It’s best to go there only if you have a high-level Defence or if you’re wearing a strong armour such as Leather/Dragonhide armour. You may also wear a wooden shield or an anti-dragon shield, as well as an amulet of defence. If you die with these items on, you keep the pickaxe, the amulet and the leather body or an ore, depending on what it is. You might want to bring Saradomin brew, as it gives 25% Defence bonus and 15% Hitpoints boost. Basically the color of the rock you’re mining is the color of the ore you get. A black rock gives coal, a blue rock gives mithril ore, and so on. The higher the level of the rock, the longer it takes to mine. If you complete the Rune Mysteries quest in the Runecrafting skill, you can mine rune essence and pure essence. The good thing about them is they don’t need to respawn, you just click on the rock once and wait until your inventory is full. It’s a very afk way to get Mining xp. If you’re mining in the Motherlode Mine, which is located in the southern area of the Dwarven mine, you will get Pay-dirt which you have to clean in the machine in the center of the mine. This gives you extra xp. 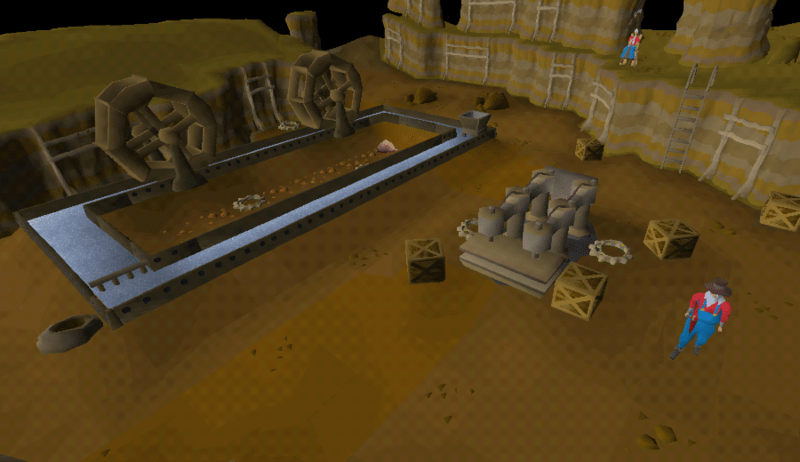 You can receive from the machine anything from coal to runite, depending on your Mining level. You have a 1/256 chance to find an uncut gem in the rock which you can increase to 1/86 by wearing a charged amulet of glory. The higher your Mining OSRS level is, the bigger the chance to mine gems. • You can try power mining, also known as drop mining, where you fill your inventory with ores and just drop them, then repeat. You don’t get OSRS gold this way and can’t use the items you mined, but the xp is faster. However it gets annoying to just empty all of your inventory even if you use the shift-click dropping. The best spot for power mining is the Al Kharid mine. However, the scorpions there will attack you if you have a low combat level. The safest place is Dwarven Mine, but the xp won’t be as good. • Some players hire runners who take the ore to their bank as payment for the running and this way save time for the miner. • It’s best to use a world with more players for Mining OSRS. Since 2014 OSRS has implemented a static respawn rate and when there are over 2,000 players in a world, most things respawn. • If you’re mining higher level rocks like adamantite or runite, it’s best to just hop in another world rather than wait for the rocks to respawn. This doesn’t work for lower level rocks as they respawn really fast. • There are some temporary skill boosts you can use such as the Dwarven stout which gives you +1 for both Mining and Smithing. This entry was posted in How-To Tips & Tricks, Latest OSRS News, Old School RuneScape, OSRS Mobile App, RuneScape 3 and tagged 1-99 mining guide osrs, dwarven mine, dwarven stout, mining guide osrs, mining osrs, motherload mine, osrs f2p mining guide, osrs mining, osrs mining guide, osrs mining guide f2p. Bookmark the permalink. ← Who is the #1 Player on OSRS?